The Sinatra Flood Action Team (FloAT) has been in action following the extensive flooding from Storm Desmond and the rain that both preceded and followed it. The headline figure was the new highest ever UK 24-hour rainfall, with 341.4mm of rainfall reported for Honister Pass in Cumbria in the period up to 1800 GMT on 5 December 2015, and a new 48-hour record of 405mm also being recorded at Thirlmere in Cumbria . Many records were also broken in river levels across the north. The combination of extreme rainfall and river levels and flows has led to significant geomorphological changes, which FloAT have been recording and surveying using dGPS and terrestrial laser scanning equipment. The storm centre tracked to the north of the British Isles, with a long weather front remaining in an almost static position across Scotland, bringing strong winds and persistent rainfall over a wide area of northern England and southern Scotland. The most intense rainfall was to the wast of the Pennines, caused by strong orographic uplift, as warm moist air was forced upwards by the hills, resulting in cooling, and condensation of moisture into droplets forming the rainfall. To the east of the Pennines the opposite effect happened, as the air mass (with reduced levels of moisture) flowed downwards, causing warming which allowed it to retain the moisture and suppressed rainfall. For Storm Desmond, this rainshadow effect was particularly noticeable, with negligible amounts of rainfall being recorded near the east coast. In north-east England, preliminary analyses (to be confirmed) of rainfall and river flows have been made by the Environment Agency (see attached factsheet, provided with permission by the EA). These show clearly the record-breaking rainfall totals across the Pennines, with accumulations over 24 hours and above estimated to be well in excess of 1 in 100 year return periods (note that even these may be under-estimated, due to the high winds), and the rapid drop in rainfall totals towards the east. In the Tyne catchment, river levels have exceeded the previous maxima within the periods of records for the North Tyne and the main Tyne, including at the lowest non-tidal gauging station at Bywell (61 years of record). Comparison of the peak levels against historical records (as reported by David Archer) show that levels in this event exceeded those of the 1815 flood by about 0.4m, but still did not reach those of the great flood of 1771, which caused the collapse of the original Tyne Bridge and resulted in several deaths . A wider analysis of historical information (to be reported in a paper focussing on flash floods for Hydraulics Research, currently under review) has shown the value of this type of historical evidence in understanding of flood-rich and flood-poor periods. Debris washed against the 19th century bridge across the River Tyne at Ovingham in Northumberland (Photo: Andy Russell). 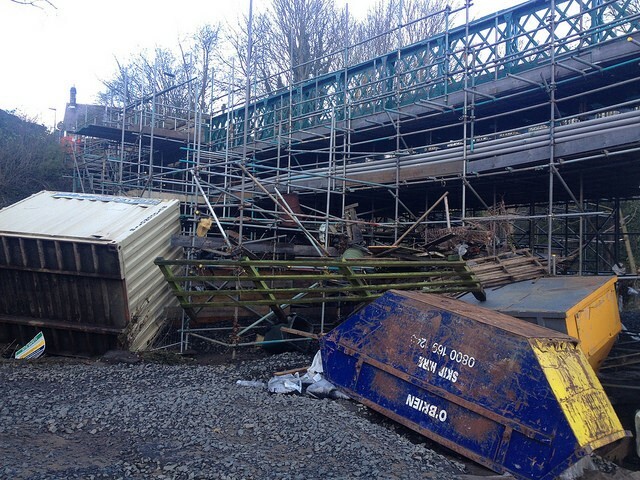 There has been extensive damage to bridges across the whole area affected during this event. Along the River Tyne, the 19th century bridge at Ovingham had just been opened on the Thursday before the storm, following 18 months of refurbishment. Extensive build-up of debris against the scaffolding has caused it to be closed to traffic until its structural integrity can be checked. Debris during floods can cause structural damage to bridges through direct impact, as well as exacerbating scour of foundations. 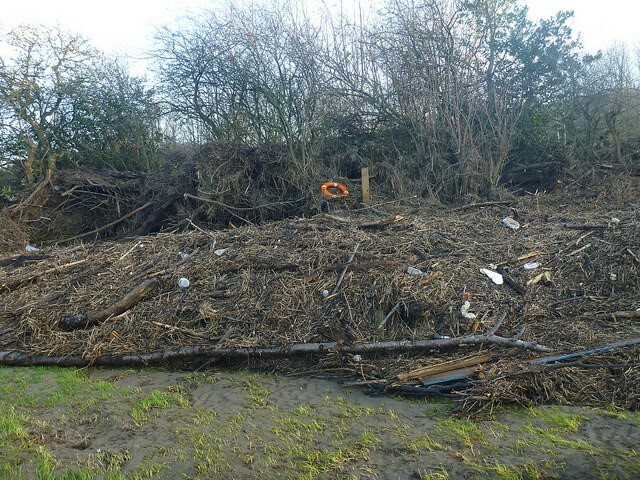 Mixed large and small woody debris, brought downstream from riparian areas in the catchment, and left with thick deposits of silt on floodplains (Photo: Andy Russell). In Cumbria, the extensive damage in many cities, towns and villages and the further rainfall this week has meant that the priority has been on safety and recovery, and the FloAT field activities are always careful to recognise this and to carry out the research work in a sensitive and sympathetic way. However, they have been able to visit some of the worst affected areas, and have carried out surveys of wrack lines in Keswick, and of the debris fan developed downstream of Glenridding, where further rainfall during this week has caused more movement of material even during the recovery activities. In Keswick, the River Greta overtopped recently installed flood defences upstream of the A5271 Bridge. At this location inundation depths and sediment loads greatly exceeded those for the November 2009 floods. In places, properties were inundated by flows depths of 1m. 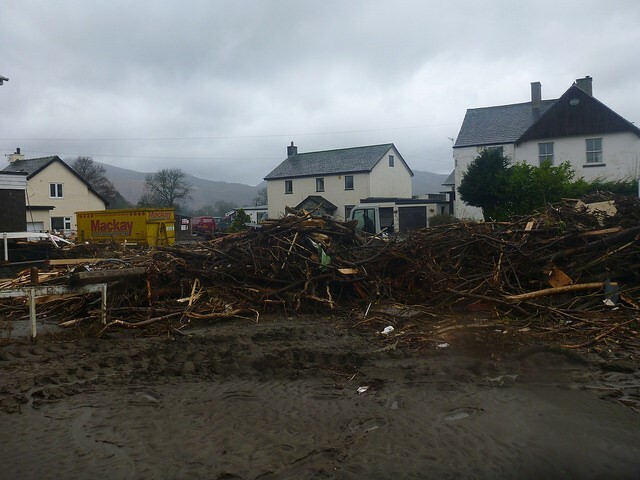 Clear-up operation in Glenridding. Excavator is removing large amounts of sediment deposited upstream of the bridge in river channel and village centre (Photo: Andy Russell). 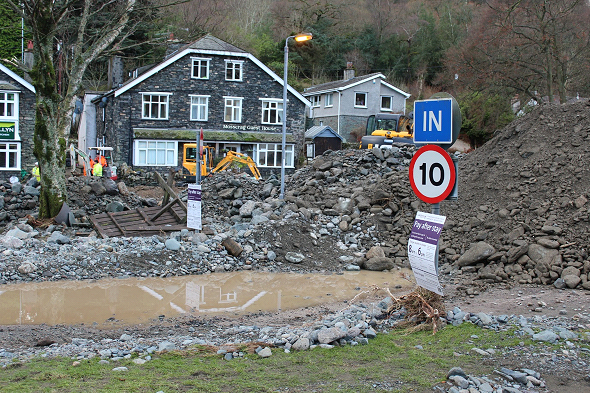 Glenridding was inundated with water and large volumes of coarse-grained sediment during Storm Desmond. A landslide further up the catchment translated into a hyperconcentrated flow allowing further entrainment of sediment from the channel margins. The A592 bridge became choked with sediment allowing several metres of sediment aggradation in the village centre, most notably around the Lake District National Park visitor centre. 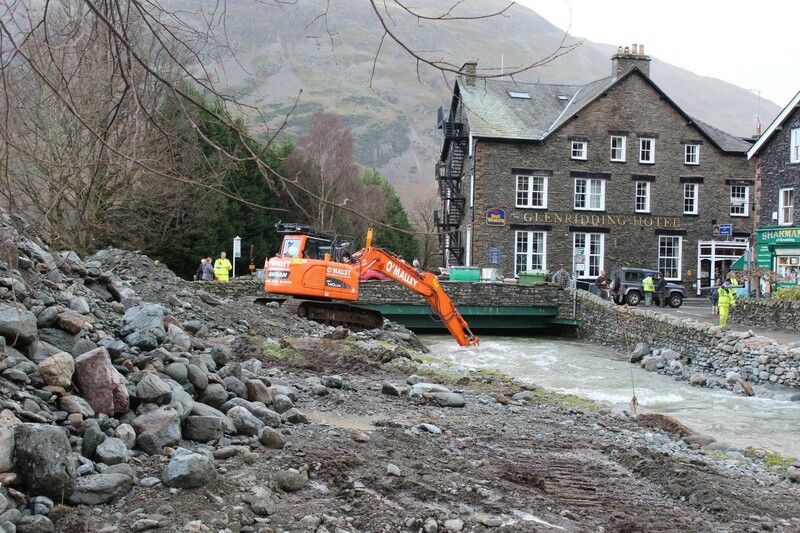 A large sediment fan was deposited downstream of the Glenridding Hotel by flows which burst from the walled main channel. 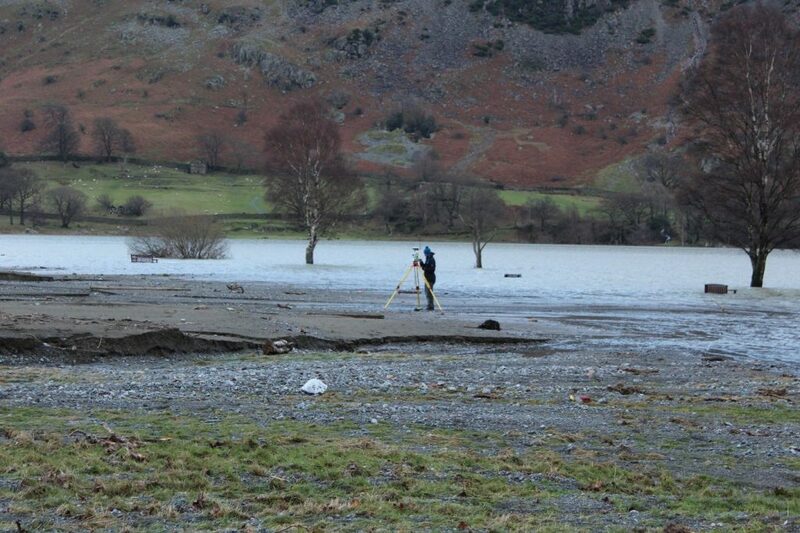 Large volumes of coarse-grained sediment deposited in the centre of Glenridding (Photo: Andy Russell). Subsequent analysis of the data collected from this event will improve understanding of the role of debris and geomorphological change during extreme rainfall and flooding, and support our abilities both to model catchment and urban hydrology and to manage their impacts on infrastructure. 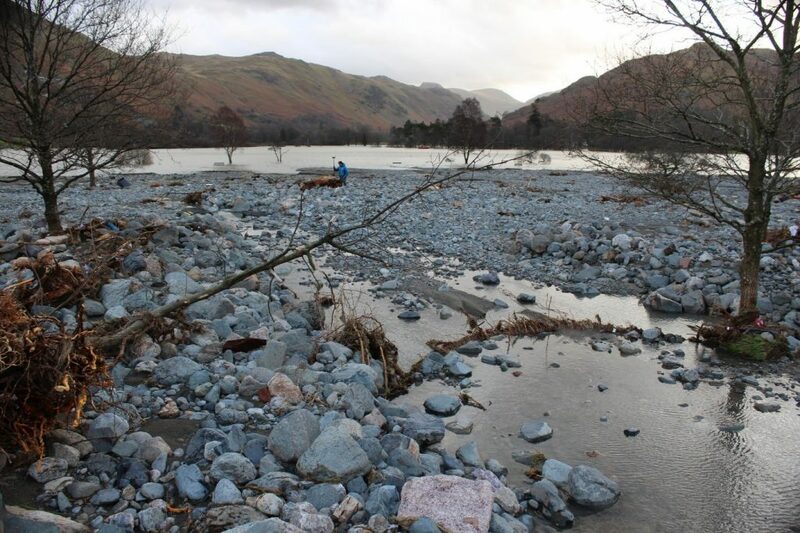 Steve Birkinshaw surveying large debris fan downstream of Glenridding (Photo: Andy Russell). Laser scanning the Storm Desmond debris fan at Glenridding (Photo: Andy Russell). Written by Geoff Parkin, Newcastle University, on behalf of FloAT (Matt Perks, Andy Russell, Andy Large) and David Archer, 14 December 2015. This entry was posted in Uncategorized on December 14, 2015 by Rob Thompson.